A new poster celebrating Sikh Heritage Month features a quote from 1867 in which Sir John A. Macdondald called for 'an army of Sikhs' to be sent from India to protect the country. To celebrate Sikh Heritage Month in the same year Canada marks its 150th birthday, the Sikh Heritage Museum of Canada took a somewhat unusual approach. The idea was to create an image that celebrates the significant contribution Sikhs have made to this country, then and now. What came of this idea is a striking black and white poster that shows in profile Sir John A. Macdonald, Canada's first prime minister, face to face with Canada's current Defence Minister Harjit Singh Sajjan. Above Macdonald's head is the date 1867 and a quote: "Send me an army of Sikhs." Above Singh's head is the date 2017 and beneath it the line: "An army led by a Sikh." Macdonald's call for an army of Sikhs came from a little-known letter he sent to his friend Sir Henry Sumner Maine in 1867. Sumner was living in India at the time. The British North America Act had just been signed establishing Canada as a new country, albeit one under threat from its larger neighbour to the south. Convinced that war with the United States was inevitable, Macdonald wrote that India — at the time a British colony — could "Do us yeoman's service by sending an army of Sikhs." His idea was that Sikhs — renown for their bravery on the battlefield — could be sent to California to hold San Francisco "as security for Montreal and Canada." Pardeep Singh Nagra, executive director of the Sikh Heritage Museum of Canada, said in many ways Macdonald's quote starts "the history of our legacy with Canada." "We've always been here," he said in an interview Thursday on Metro Morning. "So it's trying to share that narrative. This is framing us as part of Canada." Nagra acknowledged that Sikhs have a somewhat "complicated" history in this country. Nagra was a boxer who filed a human rights complaint to compete for Canada internationally while wearing his beard. Sikhs have faced other battles over the right to vote, and the right to wear turbans while serving in the RCMP. "We have always shared our toil with Canada," he said. 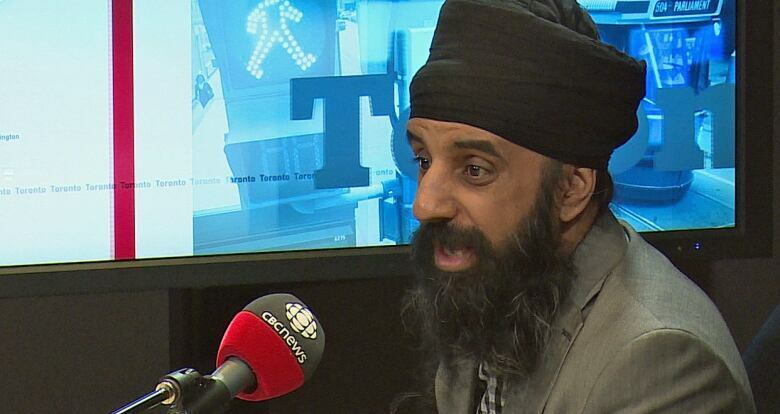 Those fights aren't forgotten, but Nagra says the poster and Sikh Heritage Month will focus on the battles Sikhs and Canadians have waged together.